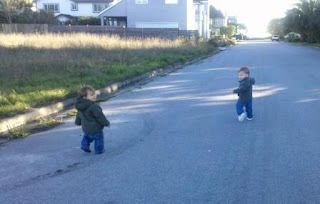 My friend N came to play with me the other day, and we decided that we were definitely big enough to go for a REAL walk. Like, without our strollers. And without our mommies….. Just kidding. Our mommies were with us….but we were almost too fast for them! I liked it so much that I was running down the street screaming with excitement! We are SO big. ← Bang On the Drum All Day…..